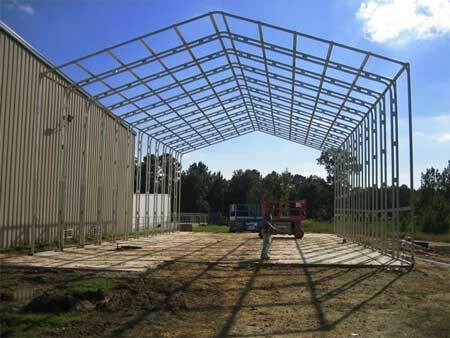 The Stand Alone Steel Building Frame System - The core of our Alabama metal buildings and carports. We use only American-made steel in our frame systems because we know the steel in our metal buildings and steel carports measures up to the specifications that engineering requires. It would be negligent of us to use anything less. Foreign steel can be just like fast-food taco meat - you don’t really know what’s in it despite what they say. What does the competition do? We use larger steel parts, stronger steel (that actually specs out), and a more corrosive resistant steel so you’re assured of the best possible product your money can buy. No other tubular steel building system offers you the flexibility and ease of installation to make your exterior walls in most any finish you want—or the inside walls for that matter. Our customers have utilized our frame system, incorporating it with wood, stucco, brick and even shingles to achieve a desired appearance. It means you won’t have cumbersome I-beams to deal with that require forklifts or cranes. That will save you money whether you build yourself or have one of our professional independent crews do it for you. It means you’re going to save on your concrete foundational requirements - depending upon the size of the metal building. That, right there, can amount to a savings of thousands. It means your end walls will not have those “cross-tie cable end supports” to contend with. A metal building should not be wired together, anyway. All that results in a very economical way to use almost any exterior material you want on your steel building—stucco, brick, stone, wood etc. Yes, you can have the integrity and reliability of US-made steel and still comply with your HOA or local building department. That means if you want an Alabama steel building, you have come to the right place!